Recently I finished several games that I’ve had on the go for a while now. As I normally do after completing a game, I started to hunt down the trophies that I hadn’t naturally unlocked during my normal play through. I browsed the list to see what I had already achieved, and what was left to get. I think it makes sense when a game gives you as many trophies during a normal play through as possible so long as you do make some effort to mix up your game play and explore, but that’s usually not the case. Sometimes I have completed a game and only acquired 10% of the available trophies. I personally think that is ridiculous, but perhaps others disagree with me? Maybe they think that’s fair and they want to get the most out of the game they bought? Everyone is different, but as a developer who has been involved with trophy design, I want to look at what options there are and why developers need to dedicate resources to their trophy list. So you’ve created your game, you’re happy with the content, now it’s time to develop your trophy list. There are so many different things you could do for trophies, but how do you decide which ones are right for your game? Here are some categories I think cover the majority of trophy options. Exploration: These trophies are rewards for exploring the game world. They include finding collectibles, exploring regions of the map, unlocking locations, and generally learning about the game’s setting. These are good trophies I think to sprinkle into your list. They get the players searching around your hard work, learning about the world you’ve created for them and discovering what makes it tick. Collectibles, when done right, can be a valuable way to deliver narrative. Giving a game world more context is always worth doing. 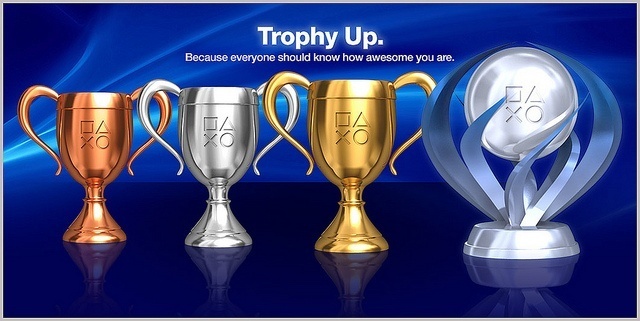 Gameplay: These kinds of trophies reward the player experimenting with game play. Getting kills with each weapon, upgrading items, using every ability or skill, and driving every vehicle. They can also be for getting combos, completing difficulty levels, and generally using the game mechanics in varying ways. These trophies are always good as they encourage players to try out all the weapons and skills we as developers put in the game. We want players to try the sniper rifle for a little while, even if they love using the SMG. A player might discover they love a new spell or ability they didn’t even know about through trying to get a trophy. Multiplayer: Trophies in this category are all about doing things with other players within the game. They could be competitive, for kills of other players, or winning so many races, or destroying enemy structures. They can also be co-operative in nature, for healing your team mates, or killing enemies that were targeting an ally, or working together to defeat the games hardest challenges. These trophies bring players together and encourage them to team up or hunt each other down and generally take their game experience online. Online only games tend to focus on this kind heavily, but thats not to say they have to. Repetition: This category of trophy is a love it or hate it kind. It can include killing thousands of enemies, gathering vast quantities of resources, gaining lots of XP or currency, completing an in-game event hundreds of times, and even playing the game over many consecutive days. These are about doing things many times over and I personally think these are quite lazy in their design. Rewards: These trophies could fit into all the other categories, but I felt like they needed their own. These are trophies that reward exceptional skill or achievements within the context of the game. Things like getting headshots, having best times, completing challenge modes of hard content, and completing levels with certain rankings all fall into this category. These categories above represent trophies that offer different game experiences and reward a player for going off the beaten track or tackling the game’s hardest content. While this list I feel is a good starting point, the trophies contained within can be good, but also can be awful. Picking the right kind of challenges is not the end as then the quantity and difficulty need to also be sorted. Trophies should be reasonable for a player to complete within the games timeframe if they are actively attempting to unlock it. Creating a trophy that forces the player to do something an unreasonable amount can be devastating. Here’s an example. I have a game where I have two kinds of collectibles; the first kind are chests that give the player resources and currency. They are all over the game world and there are hundreds. The second kind are journals. These expand upon the game’s lore and there are only 20 of them in total. Now despite the second kind being harder to find as there are fewer of them, having a trophy to find the journals as opposed to the chests should always be preferable. You can get currency from other places, but you can’t get the information in the journals anywhere else and it also gets the player exploring the world in an effort to find them. Trophies are important. As gamers, we often measure our gaming skill on how many we can acquire. We like games more when they have a carefully thought out, diverse, and well implemented trophy list. As developers, trophies allow us to extend the life of a game and give players a chance to do some cool things in our world that they might not have even tried before. It gives players something to aim for and strive for and to test themselves against. There are even entire youtube channels and websites dedicated to the hunting and acquiring of achievements/trophies. Too often I see games release with bugged trophies, or a list of achievements made up entirely of reptitive, dull, unimaginative tasks that would require a player to grind for many more hours than should really be necessary. These kind of trophies can sour the mentality a player has towards a game and lead to negative comments and bad experiences. It’s important as developers to understand that people care about trophies and for many they are an essential part of their game experience. I think you can tell a lot about a developer from the trophy list, and after a while it’s easy to see which games were made by gamers for the love of the medium, and which ones are just ticking the boxes they feel are required. If you’re a developer reading this, please, don’t just tick a box, put some effort and love into your trophies and I promise your gamers will thank you for it.